Join Us or Donate Now! We commemorate Lincoln’s Gettysburg Address by co-sponsoring the annual Dedication Day event on November 19th at Soldiers' National Cemetery. 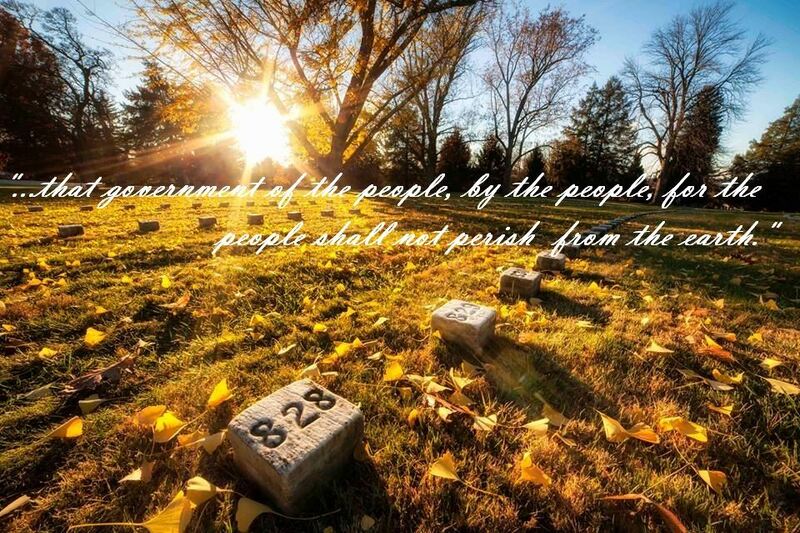 We honor the more than 3,500 Union soldiers buried in Soldiers' National Cemetery whose sacrifice Lincoln’s 1863 address so eloquently exalted through our annual, summertime “100 Nights of Taps” program. We educate Fellowship members, citizens of the Commonwealth of Pennsylvania, and the United States of America on Lincoln’s legacy, as well as on the Gettysburg Address and its impact on all peoples not only through our annual Dedication Day events, but also through co-sponsorship of Gettysburg National Military Park’s Traveling Trunk Program. We promote awareness about Lincoln’s role in Gettysburg’s history and his enduring legacy by maintaining the “Return Visit” statue in Lincoln Square. 100 Nights of Taps 2019 will kick off on Monday, May 27th at 7 p.m. in Soldiers' National Cemetery. Read more about the program and this summer's schedule of buglers! The 2019 Dedication Day Program will be held on Tuesday, November 19th. Learn more about this year's program, including the keynote speaker and LFP luncheon program. See all upcoming events and projects in the Gettysburg area at Destination Gettysburg. The Lincoln Trunk is Touring! The Lincoln Trunk, which YOUR generous donations helped to sponsor, is traveling to various schools, helping students learn about Abraham Lincoln and the Gettysburg Address. Board Member Ken Kime, Vice President Wendy Allen, President Steve Herr, NPS Education Coordinator Barb Sanders, and Secretary Gene Mortorff with our Lincoln trunk! Follow 100 Nights of Taps on Facebook! Be sure to follow our monthly column in The Gettysburg Times, the last Saturday of every month, for articles written by board members about Lincoln-related topics, Fellowship events, and the history of our organization! 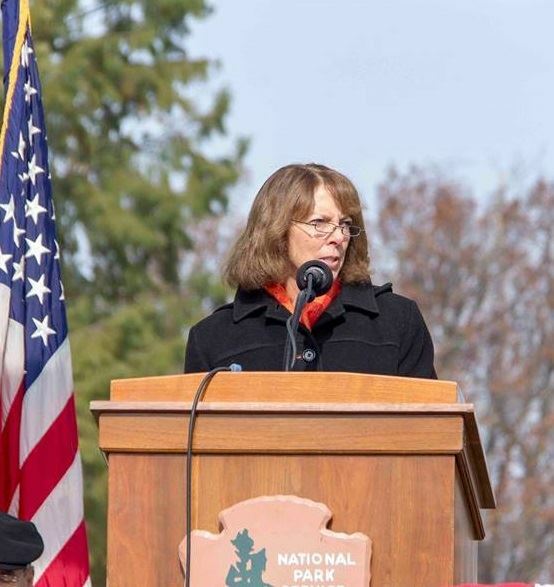 Janet M. Riggs, President of Gettysburg College, delivered a powerful and timely keynote address at the November 19 Dedication Day ceremonies in Soldiers' National Cemetery at Gettysburg National Military Park. Tom Forsyth, Acting Superintendent of Gettysburg National Military Park and Eisenhower National Historic Site, welcomed the crowd of hundreds to the Soldiers' National Cemetery for the 155th anniversary of its consecration. Jim served as President Abraham Lincoln for the annual Dedication Day Ceremonies for many, many years (30+ years) and we still grieve his 2015 passing. We salute and honor Jim for his years of service to the community and across the country--to many of us he WAS Abraham Lincoln. We will miss you Jim, but will never forget you. Read more about Jim's legacy. Your officers are here to serve!